06/01/2012 : Bending joint - faster and better. New stanchion does the job! 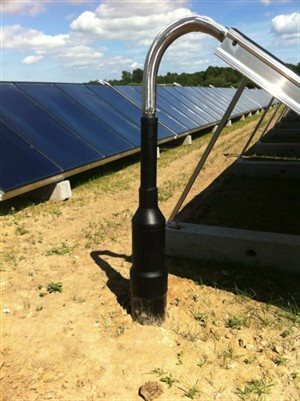 The ea energy stanchion concept is the fast, easy and secure way to connect your above or under ground pipe loop to the solar thermal collector rows. No complicated assembling on site. Just make the connection from the supply or return pipe! In case you have special preferences to the regulating or 3-way valves this is easy to build in to the stanchion system at ordering.